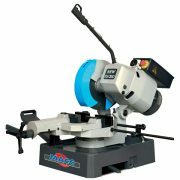 Looking to buy high-quality European Metal Cutting Coldsaws at a competitive price? 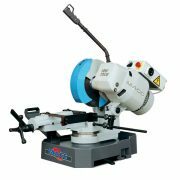 The Italian-made MACC coldsaw machines are available Australia wide through our network of distributors. We have stock warehoused in Brisbane, Melbourne, Adelaide, Tasmania and Perth, and machines can be freighted to all locations across Australia and a number of countries internationally including New Zealand, South East Asia and the South Pacific. We guarantee customer satisfaction for every coldsaw we sell. All machines are covered by warranty and prompt backup service is assured. Coldsaws are an essential cutting tool used in most metal workshops thanks to the accurate and high-quality cut produced. 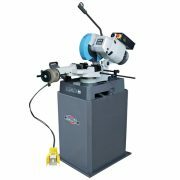 These circular sawing machines are ideal for most metal cutting operations, and work bycutting metal plates at a low RPM, reducing friction and heat to deliver a fast, clean cut. 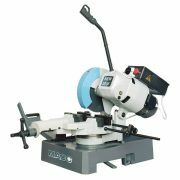 These metal cutting saws are fast and will cut all types of materials accurately. The blades used in coldsaws transfer the energy and heat created in the cutting process to the chip, thus resulting in the blade and work metal remaining cold – hence the name ‘coldsaw’. Coldsaws can machine most ferrous and non-ferrous alloys. The blades on coldsaws can also be reused and sharpened when they become blunt. In fact, coldsaw blades can be sharpened up to 40 times! Coldsaws are known for delivering an accurate and clean cut direct from the machine, so if a quality cut is what you are looking for, the coldsaw is an excellent choice. MACC metal cutting coldsaws are available in three different variants: manual, semi-automatic and vertical semi-automatic. 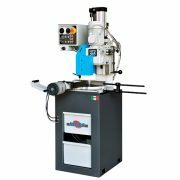 These high-quality Italian machines are designed for the most demanding industrial workplaces and deliver precisely accurate results. 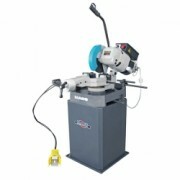 Every coldsaw we sell comes complete with a blade, and optional stands are also available. MACC coldsaws have a regular circular slow moving blade, and the blades can be resharpened over and over again, making it a highly durable and long-wearing machine. MACC coldsaws have a round cutting capacity of 70mm up to 100mm depending on the model you choose, so if you are working with fine metal and need a top quality and highly accurate cut, this is the best metal cutting saw for you. 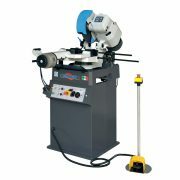 All MACC manual coldsaws will cut through your metal pipe and pieces of steel with ease. These saws are powerful, accurate and the most affordable option, as long as you don’t mind being present at the machine and holding pressure on the blade while it cuts. Manual coldsaws are often preferred when there’s only a small number of parts that need to be cut because the machine has to be manned throughout the cutting process. Unlike semi-automatic coldsaws, however,it takes no time at all to set up for the cut. That means you can start the cutting process instantly. When choosing a manual coldsawfrom MACC, all of our Italian-made manual coldsaws from the 225mm right up to 350mm also have a swivel head for maneuverability and can deliver a range of cutting capacities. Semi-automatic coldsaws do all the work for you. Just set up your machine for the right cut and it will cut through your steel without any manual handling or control needed. This option is ideal if you have large production runs so that many cuts can be completed with minimal machineinterference. All the key elements of the cutting process are handled automatically including the vice closing, blade motor starting, cutting head downstroke, return of head, blade motor stop and vice re-opening. You can set and forget and know your cut will come out correctly. Instead of having to clamp the work and feed the blade into the piece manually, a semi-automatic coldsaw does the hard work for you. No need to stand there and use your muscle power through the entire cut! The clamps will engage with the simple press of a button or footswitch depending on the model you choose, and the blade will feed automatically, stop at the end of the cut and raise ready for the next cut all on its own. That way, you don’t have to be watching the machine while it cuts. 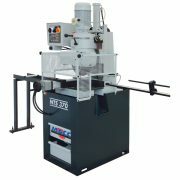 See our 350mm Semi-Auto Swivel Head Coldsaw product page for full information. Vertical coldsaws are more rigid than standard horizontal coldsaws. The finish quality is far better, and the level of chatter is decreased when completing your work. These machines are top of the line for efficiency and guaranteed to produce a high-quality cut every time. Our 315mm cuts at maximum capacity and features an adjustable material stop for repetitive production and a recirculating coolant system with an electric pump. 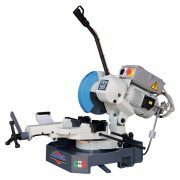 You can’t pass up the quality and durability of Italian-made coldsaws from MACC. We want to ensure every welding and metal fabrication workshop across Australia, New Zealand, South East Asia and the South Pacific has access to this unbeatable range of coldsaws. Head to our product pages to request a quote or contact us today if you have any questions about the coldsaws we have available.